There are certain aspects about us that define who we are. I'm a natural goofball. It's just who I am. That defines me. MaryFran is a goofball. I'm a loyal friend. Sometimes that's to my detriment as I get taken advantage of. But that defines me. So much in our lives define us. But it hit me today while talking to a friend that there is one thing that should never define me. I should NEVER be defined by my weight. And I better include a goofball pic!!! 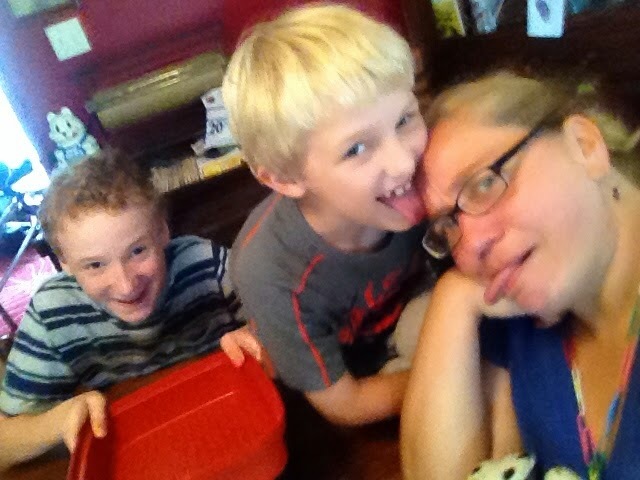 I had to trick my oldest nephew into getting in the picture and while my tongue is out being a goofball I'm not quite sure why my youngest nephew is licking my head! Oh yes, my weight affects who I am. It can't help but affect who I am. However, my weight should NEVER define me. Fat or thin I am me....and you know what......for better or worse, I like me. All that said, I am more motivated than ever to lose the weight. Not because I NEED to. .....because I want to! We went to Lancaster yesterday. I hit up the Green Dragon (farmers market) and as we walked through I scanned the produce stands and on the way back to the car I gathered up produce at some great prices. I spent something like 12 bucks and in my kitchen I have spinach, bib lettuce, grapes, two cucumbers, , some carrots, pineapple, two cantaloupe, 5 kiwi, 8 pears, and a dozen ears of corn. I have NO EXCUSE to not eat healthy this upcoming week! 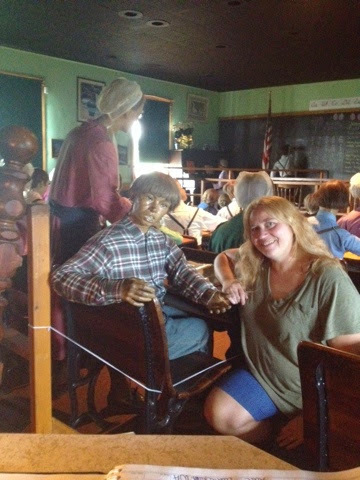 And a picture if me in a school house attraction that had been closed for years but is now reopened as the new owner tries to save the historic building. The mantra "Nothing tastes as good as thin feels" is a good one...I'm changing it though.. Totally agree. I changed that mantra up a long time ago. "nothing tastes as good as skinny feels" originally came from Kate Moss when she was in the height of supermodel-dom and then years later, she said she wished she'd never said it. I've changed it to "nothing feels as good as fit/healthy/strong/free/confident feels". I'd like to get to a place where when someone asks me to do something, how I'll feel, what I'll wear,how I'll look etc, won't even be a thought before I say yes. Totally agree as well. It's about how you feel about yourself no matter what weight you are that really matters. LOVE this post...such great insight! I need to get out of the mindset that overweight = "bad." The funny thing is, I don't feel that way about other people - only myself. So if I can accept someone else overweight is a lovable, successful, worthwhile person, why do I have such a hard time with accepting I'm all though things, too, no matter what I weight?